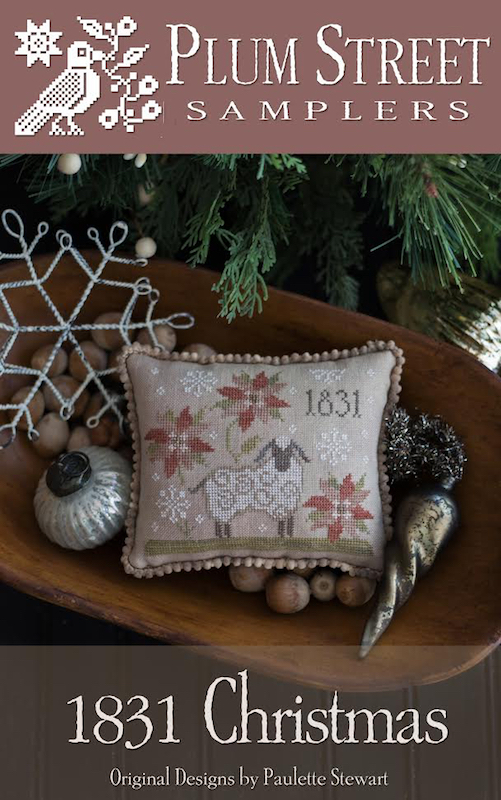 Originally, Paulette named this design Cotswold Christmas, but then realized the sheep looks nothing like the Cotswold breed, so changed the name. However, 1831 is the year that Cotswolds were introduced to the US. Threads used: The Gentle Art in Woodrose, Old Red Paint (more of a brown dye lot, rather than pink, if possible), Toasted Barley, Shaker White, Linen, Endive, Wood Trail, Wheat Fields, and Oatmeal. Stitches used in this design are cross stitch over two threads and some backstitching at the centers of the poinsettias.